Pedometrics is a branch of soil science that applies mathematical and statistical methods for the study of the distribution and genesis of soils. The goal of pedometrics is to achieve a better understanding of the soil as a phenomenon that varies over different scales in space and time. This understanding is important, both for improved soil management and for our scientific appreciation of the soil and the systems (agronomic, ecological and hydrological) of which it is a part. For this reason much of pedometrics is concerned with predicting the properties of the soil in space and time, with sampling and monitoring the soil and with modelling the soil’s behaviour. Pedometricians are typically engaged in developing and applying quantitative methods to apply to these problems. These include geostatistical methods for spatial prediction, sampling designs and strategies, linear modelling methods and novel mathematical and computational techniques such as wavelet transforms, data mining and fuzzy logic. 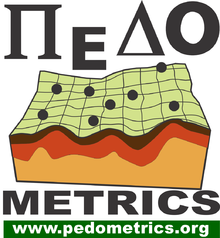 Pedometrics began as a Working Group of the International Union of Soil Sciences (IUSS) in 1992 that was promoted to an IUSS Commission in 2004.